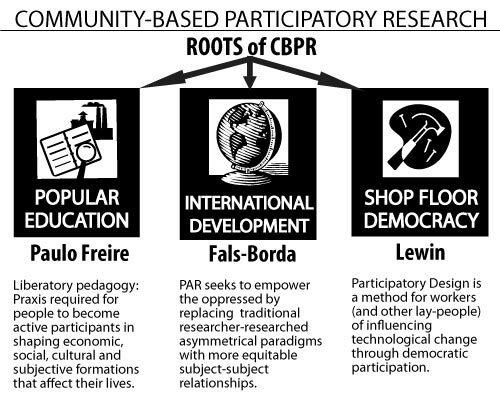 Community-Based Participatory Research (CBPR), is a relatively recent innovation in problem solving and knowledge creation. CBPR addresses issues and solves problems of social, political, and health disparities where traditional research methods fail because it works with rather than for communities, taking into account specific social realities that often cause the disparities. 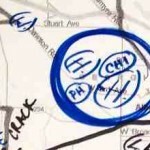 The creation of a fully participatory partnership between community members and technically trained experts and investigators is the critical component in any CBPR project; evidence from many sources suggests that what guarantees the production of good science is in fact the promotion of community-defined problem solving. Grassroots communities and research agencies use CBPR to conduct equitable, transparent, and ethically sound research on community-defined problems. By undertaking research projects with community-defined questions, CBPR allows researchers to undertake only those research projects which are most relevant to a community in question, creating stakeholder relationships and buy-in that is otherwise often absent. 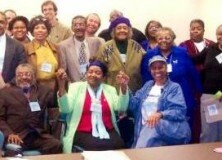 In CBPR, the knowledge and expertise of community members matters as much as formally trained researchers’ expertise. In addressing health disparities, for instance, community members’ knowledge almost always provides a critical complement to an epidemiologist’s expertise. Though the epidemiologist understands the biological basis of disease, the researcher generally does not understand precisely the underlying socioeconomic realities that foster disease in a certain community, or that might make solutions impossible or difficult to implement. The community member, who daily encounters these underlying problems, provides essential data, often the pieces of the research puzzle that are missing.